The Hollinwell should strip a lot fitter at Kilkenny Point to Point! The Kilkenny Foxhounds have the weekend to themselves in the Point to Point fields with a fixture at Grennan in South Co Kilkenny. With 19 entries in the Open Lightweight a number of names pop out including Eugene O’Sullivans The Hollinwell from Co Cork. Last seasons champion horse returned to action at Tinahely earlier in the month but had to give best to the 5 year younger Co Wexford challenger Need To Know for JP Brennan. O’Sullivan might well have been a little easy on the 11 year old son of Classic Cliche since Kinsale in June and he should strip a little fitter here if getting a run. Gordon Elliott’s new recruit Oscar Barton also holds an entry here. Already a winner this season his defeat of Mossy Joe on the track at Cork earlier in the summer is good form and would see him in with a major chance! When you throw in a couple of veteran horses in the shape of Sean Aherne’s ,Isourbell, and Susan Oakes and O’Muircheartaigh the pace will be quick over the 3 mile track. The meeting also stages a 4 year old Maiden with 19 potential runners, with some interesting sires including Mahler, Black Sam Bellamy, Shirocco and Robin Des Pres all represented. The Winners contest has a possible maximum field of 12, while 20 mares hold an entry in their own maiden. The only race that could see a divide is the 36 entries in the 5 and 6 year old geldings maiden and the meeting will come to a close with Novice Riders maiden for older horses. So it wont be a long day and it promises much for all concerned! Codds six winners proves he wont relinquish his title that easily. The battle lines were well and truly drawn even at this early stage in the race for champion Point to Point rider over the weekend. Derek O’Connor leads the table with 8 winners, following a fine treble at the Co Limerick Foxhound meeting in Rathcannon. While Barry O’Neill kept tabs on him with a nice double at Loughanmore on Saturday being added to with another winner at the Meath and Tara meeting at Tattersalls Farm seeing him on the 7 winner mark. Both of them however will sit up and take note of the hurricane unleashed by Jamie Codd over the weekend with the reigning champion riding six winners, with a treble at both Loughanmore and at Tattersalls Farm. Codd is nothing, if not competitive and these winners prove one thing, he wont relinquish his title for lack of effort!! Loughanmore in East Antrim saw the Wexford man take the Open Lightweight on Liam Kenny’s Vital Plot. This is a classy horse who got back to winning ways here and I wouldn’t be surprised to see him put away by Kenny till spring time if the going deteriorates in the next few weeks. Codd opened with a win for another Wexfordman in the shape of Denis Murphy on Shantou Village. This 4 year old debutante by Shantou was reported as having won this well. With Tom O’Sullivan listed as the owner this young horse will likely see the inside of a new stable in another trainers yard before long. The Codd treble was completed on James Lambe’s Shanroe Santos with the 5 year old Definite Article horse’s track form far superior to any of the others and so it proved. Barry O’Neill didn’t see Jamie Codd’s rear in every race as he had a double here himself. He shared this with Donnchadh Doyle and Colin Bowe, with Mr Mountain and The Tinker Molly both winning. Mr Mountain only a 4 year old by Mountain High took this Winners race and is likely destined for pastures new if Donnchadh Doyles past record is to be used as evidence, while Colin Bowes Flemensfirth mare The Tinker Molly might just stay put in his yard with an option of a run on the track a possibility. The Codd hurricane blew into Tattersalls Farm on Sunday afternoon striking in the very first race with Washington Lady for Donnchadh Doyle. This Beneficial 4 year old mare will head to the sales following this impressive win. Doyle has his yard in good form and his second winner of the day at the track , Crosshue Boy will head the same way following his win in the Winners under Barry O’Neill. Doyle actually had four winners over the weekend as he also saddled Uppertown Society to win at Rathcannon with Rob James in the saddle, to put himself in first position in the handlers table! But back to the hurricane and Jamie Codd took the Open over the Banks course at Tattersalls Farm when winning on Denis Murphy’s Theroadtocroker causing an upset in defeating the British import Current Exchange. His sixth winner of the weekend came on Ballyhack Buck for Ross O’Sullivan and Nina Carberry. While down in Limerick Derek O’Connor won on Maberry for Robert Tyner, The Chuckmeister for John Berry and Out Now for John Gleeson to record a nice treble on the day. But in truth Codd’s tally of six winners was like a hurricane over the weekend and promises much for the rest of the season. The Point to Point world is well catered for this Halloween Weekend in Antrim, Limerick and Meath. With action in three of the four provinces in Ireland this weekend the point to point world is well catered for with East Antrim , Co Limericks and the Meath & Tara Hunts all in action over this October Bank Holiday Weekend. All three meetings offer a fair level of interest to anyone interested with the East Antrim Hunt getting the ball rolling at Loughanmore on Saturday the 25th in Ulster. With the Islandbawn Open scheduled for 4.00 a maximum field of 16 can face the starters flag. The strength of this race could rest with last weekends Loughbrickland form where Oscar Barton and Vital Plot finished first and second in the Open Lightweight. Its probably questionable if both will be in the line up with a quick surface the key to Liam Kennys Co Wexford trained horse Vital Plot. Rain was not that evident in his part of the world but I’m not sure if everywhere else was that lucky. With the 10 year old flat bred son of Theatrical recording a fine second to On The Fringe at Punchestown last May he should be a serious challenger again next spring in quality Hunter Chasers. The same might also be said of Oscar Barton with the April Cork Hunter Chase winner proving his wellbeing at Loughbrickland when putting Vital Plot in his place. With a transfer to Gordon Elliott this season seemingly giving the 9 year old Oscar gelding a boost he may just be a force this season. The field also boasts the seasons first Open winner in the shape of Loughnagall for Ciaran Myrphy and Dot Love , Highly Unlikely from Liam Lennons yard and Kerrib Castle from Stephen McConvilles Co Armagh yard. When you throw in Vincent Halleys trio of Boxing Along, Charlie Swift and Valentino’s Choice with David Christies , Bullock Harbour, Nodforms Violet and The Last Derby , it looks like a fairly competitive race in prospect. The Open at the Co Limerick Foxhound meeting at Rathcannon also promises much on paper on Sunday the 26th. With 21 horses entered on the afternoon at the Munster venue it could well be the race of the weekend. But with so many double entries, the likelihood is that one or two of them might try elsewhere or wait for another day. Enda Bolgers , Mossey Joe, had to settle for third place at Aintree in the Foxhunters and again at Cork in April. The 11 year old Moscow Society gelding was just a little disappointing , particularly behind Oscar Barton at Cork so he needs a couple of strong performances to get him back to the top for owner Barry Connell. With Eugene O’Sullivan holding entries with Cork Citizen and Galloping Gander , I’d fancy the first named with the 6 year old son of Overbury looking to have further improvement in him. Another two handed trainer here is Co Clare based Noel Glynn with his Loughrea Open winner Becauseicouldntsee and Listowel Hunter Chase winner Gonebeyondrecall. Both of these are more than capable of winning on their day, so they shouldn’t be excluded. While Co Cork based Paul O’Flynn might give Nevskij a run here with the 9 year old Beneficial gelding fit from a couple of runs on the track. As I said , if they all turned up!!! The other Open will be staged at the Meath and Tara meeting at Tattersalls in Co Meath with the Banks course in operation. Disappointingly only 9 horses were entered but it might be worth taking note of Gordon Elliotts new recruit , Current Exchanges. Owned , like Oscar Barton by Kaniz Bloodstock this ex British performer , an 8 time Point winner and 3 time track winner will give a great line between Irish and British form. The previously mentioned Gonebeyondrecall also has an entry here while Serious Times and Theroadtocroker might trouble the more fancied horses. It looks like being a nice weekend in the point to point fields, try not to miss it! Its a Touch of Deja Vu at Loughbrickland with O’Connor back at the head of affairs! 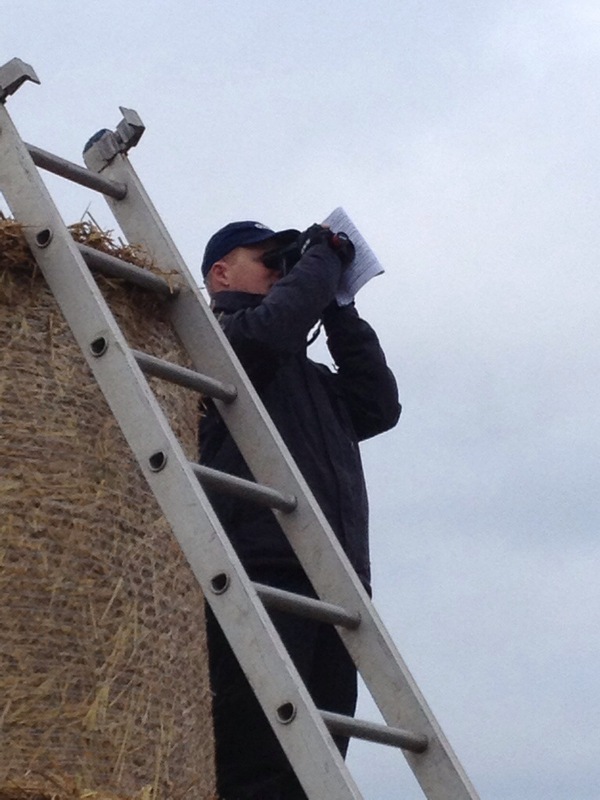 Do you know the Point to Point season is beginning to have a Touch of Deja Vu about it !!! 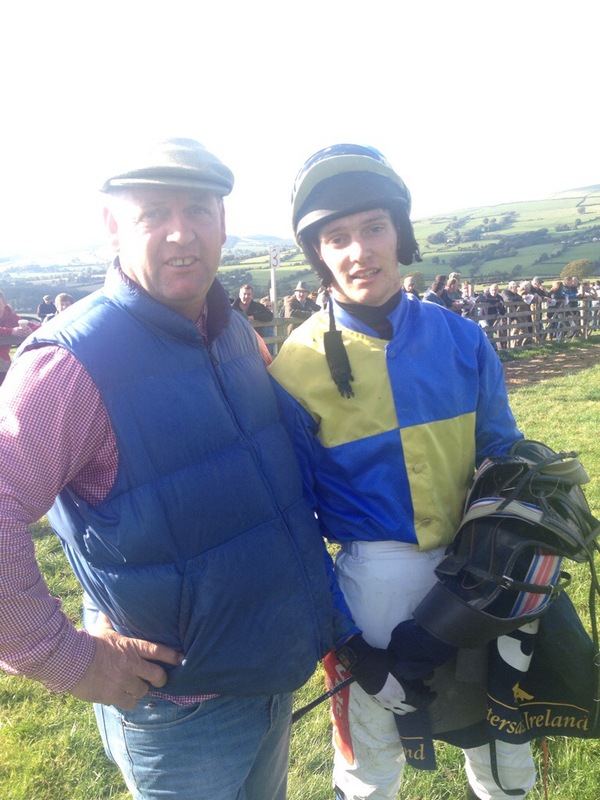 Derek O’Connors double at Co Down fixture at Loughbrickland on Saturday saw the multiple champion jockey back on top of that particular table. With a glint of steel in the eye the Galway man is intent on challenging Jamie Codd in 2014/15 for the title. O’Connor teamed up with Colin McKeever and Wilson Dennison to take the 5 Year Old Geldings Maiden with Kerisper. Given a nice introduction at Necarne in May the Robin Des Champs horse took this comfortably. With Rathbarry Stud happy to see a point winner for their stallion Robin Des Champs this horse is likely to race in new colours before long. 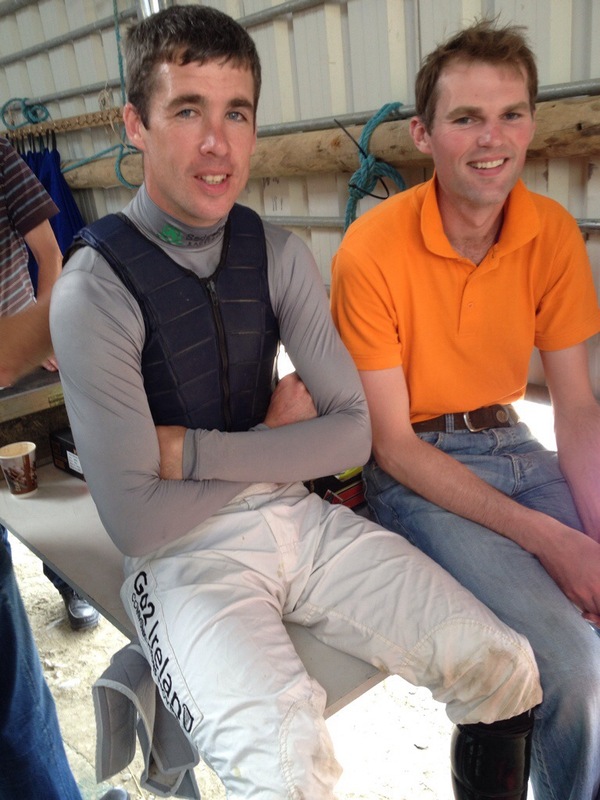 O’Connor was seen at his strongest in the Winner of Two when Chosen Dream held on by a head from JC Barry’s LOL JK. Chosen Dream had a bit of track form, twice placed in Britain, to his credit, but the 6 year old by Well Chosen seems to have blossomed in this sphere. A return to the track might well happen for Graham McKeevers horse as he has a handicap mark, but from this vantage point he might be better staying at this level with a tilt at some hunter chases in the spring time a possibility. Knockhouse Stud in Co Kilkenny will have been more than pleased to see their stallion Touch Of Land have a 4 year old Maiden winner in the shape of Lovely Job. Having his first run since Oldtown in March the Donnchadh Doyle trained horse took the opener here under Barry O’Neill. Wexford based Doyle has developed a real knack of racing, winning and selling point to point horses over the past number of years. They usually race in name of the Monbeg Syndicate but unusually this winner raced in the name of the D & N Syndicate , but I would be surprised if he wasn’t sold on , either privately or in the sales ring. Tim Donworth must have been all smiles following the Open Lightweight having ridden Oscar Barton to victory. The former Sam Curling in mate , an Open winner earlier this year , has since then changed hands and moved stables. Now in the care of Gordon Elliott , the 9 year old Oscar gelding, a track winner in the past looks likely to give Donworth and the Kaniz Bloodstock Investments Partnership a few more good days. They readily defeated Vital Plot, making his seasonal debut for Liam Kenny and Jamie Codd, with that horse noted in running for the future. Codd got his season off on a winning note later in the day as he took the older geldings maiden with Hillview Lad for Mark Quigley. This Vinnie Roe 6 year old had a bit of placed form to his name and probably deserved a win at this level, while Lester Doran took the mares maiden with the Dilahaan mare Remember The Past. Raced on the track in April 2014 by the Co Louth based , Doran, the mare benefitted from this experience to score. It would he a major surprise to me if the Jamie Flynn winner wasn’t tried again inside the rails. So with Derek O ‘Connor back on top, you can see why it feels a little like Deja Vu!!!! Only one Point to Point fixture this weekend. 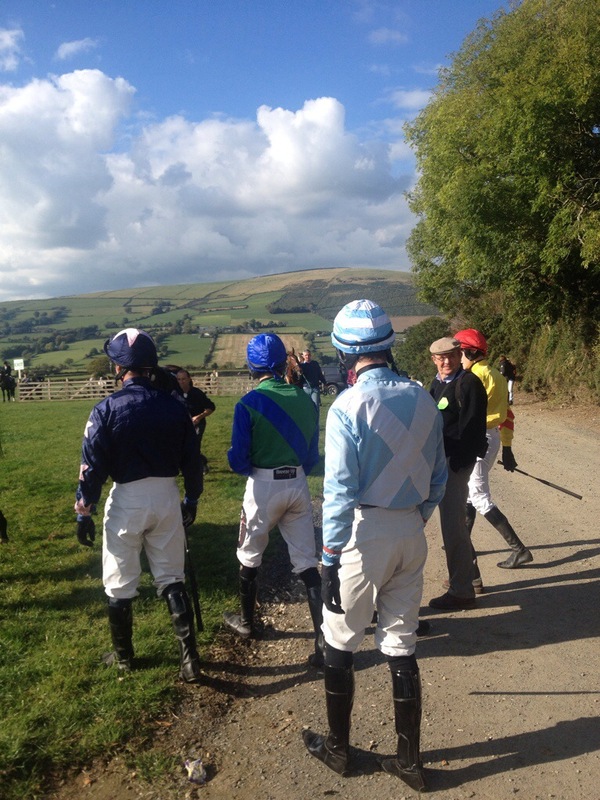 Loughbrickland holds court this weekend in the Point to Point fields with the Co Down fixture on Saturday the only one in a condition to race following the cancellation of the Golden Vale meeting. The 13 runner Open Lightweight looks like being a good race on paper with Klassy, Sebadee and Vital Plot all given an entry. The ground is the key to each of these with neither Sam Curling, Denis Cullen nor Liam Kenny likely to risk their horses on soft ground. Derek O’Connors double at Loughrea on Fact of the Matter and Presenting Lisa sets him up well at this part of the season with Jamie Codd chomping at the bit to get his season under way. Other jockeys quick out of the traps this year include Mark Scallan and JJ Slevin who both opened their accounts with wins on Teds Island and Subtitle where early season form was worth taking into account. You won’t notice the months slip by with the Spring Point to Points announced! The announcement of the 2015 fixture list this week will see many of us putting on the winter wellies , thermal underwear and all sorts of headgear in an effort to negotiate the weather that comes our way. Its seemingly known as the “spring fixture list” , but as it begins in December 2014 and finishes on the June Bank Holiday weekend, that name is nearly as bewildering as the form shown by some of the horses that win during the season. 82 meetings are scheduled from the 30th December with the Duhallow Foxhound meeting at Dromahane right through to the South Union fixture at Farrangalway on the 31st of May. This sees the Kinsale meeting reverting to its previous role as the seasons end, and boy oh boy thats likely to be one hell of a party. Just what has happened to the Ballingarry meeting I’m not sure but ……. One meeting is scheduled for the 30th of December, with a further ten proposed in January with the Shillelagh and District Foxhounds joining the United Hunt on the 4th and the month finishing off on the 31st at East Down with a couple of fixtures each and every weekend. February sees the level of activity increase with a total of 14 meetings in the month with Co Clare and the United Hunt on the 1st sharing the weekend with the Tyrella meeting on the 31st. With three scheduled meetings on the 8th, four pencilled in on the following weekend on the 14th and 15th and a further four meetings on the 22nd its a busy period. March has 4 point to points on Sunday the 1st which ushers in the busiest month of the season with twenty three meetings on the cards. With 4 and 5 meetings most near every weekend the month closes with a double Brosna Foxhound meeting in Co Offaly clashing on the 29th with Cloyne and Bree on the same day. 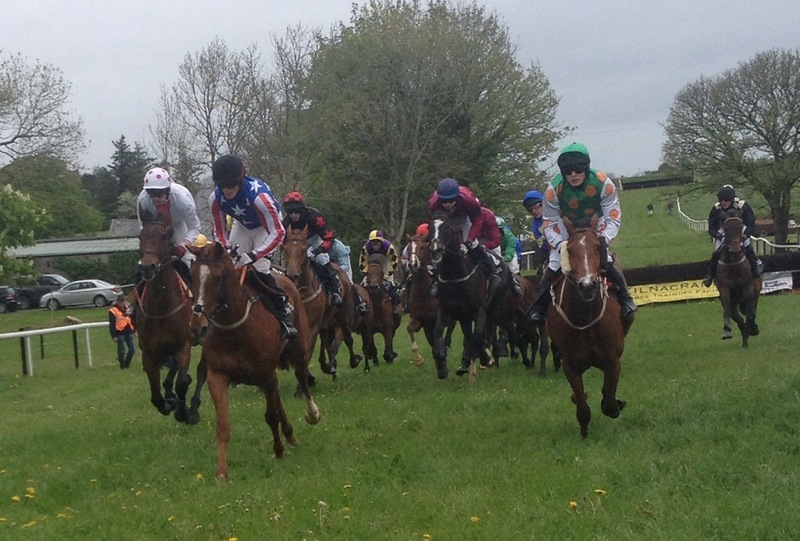 Killeagh races on April Fools day at Inch which sees 19 meetings proposed in the month. This is a real month for double fixtures as East Antrim Hunt race on the 6th and 7th for their Easter meeting. The Duhallows split their two day fixture on the 11th at Kanturk and Dromahane on the 12th while the Killultagh, Old Rock & Chichester race on Friday the 24th and Saturday the 25th. The month of May brings the season to a close with 15 racedays culminating on the 31st at Farrangalway. It all seems like being a long way off, but believe me you wont notice the days slip by and it will all be behind us! The sun shines on a Barry O’Neill treble at the Shillelagh Point to Point. 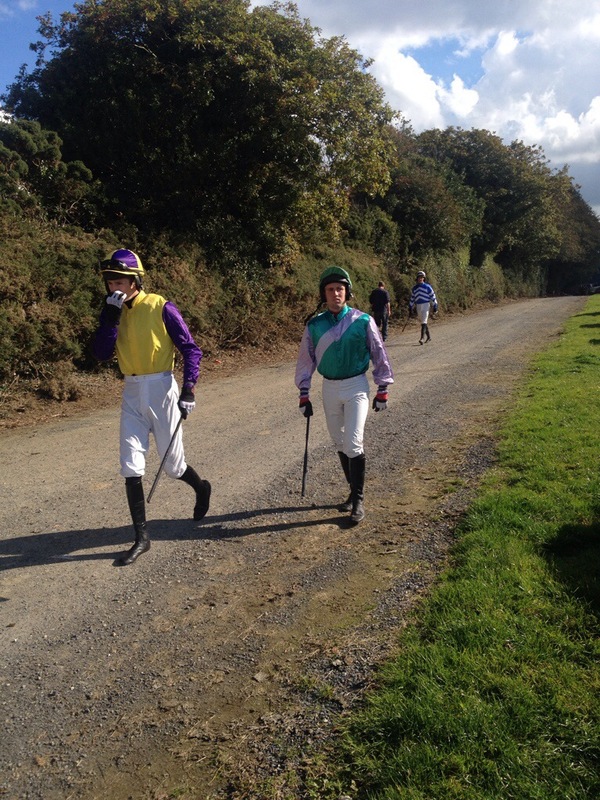 The Autumn programme of the 2014/15 Point to Point season kicked into gear at Tinahely on Sunday with the Shillelagh and District Hunt meeting at Fairwood Park. As always at this Co Wicklow venue every effort was made to ensure that everyone, including horse and jockey were accommodated as much as possible. With the ground being described as Good to Firm, the watering of the track with in excess of 100,000 gallons of water was much needed. But that said some horses just prefer quicker ground and they didn’t do any complaining here! With an entry of just 60 horses the 65% declaration saw 39 face the starters flag with the star of the turn being Barry O’Neill , who recorded a nice treble at the South Wicklow venue. The Open Lightweight run over 3 miles saw 6 of the 10 entries declared with The Hollinwell making the trip from Co Cork going off the hot favourite. Last seasons champion horse was reunited with the Trainer, Eugene O’Sullivan’s son Eoin but they were overturned by Barry O’Neill on John Brennan’s ,Need To Know. With Paul Power setting a sedate enough pace on Vincent Halley’s Valentino’s Choice, O’Neill kept Need To Know in close proximity towards the front. Jumping well, the 6 year old Definite Article gelding took up the running on the turn out of the back straight and easily held the challenge of O’Sullivan and The Hollinwell who came out of the tightly packed field. O ‘Neill started his day off well in glorious sunshine at the track when taking the 4 year old maiden on Gingili for Colin Bowe. With two runs under his belt at Toomebridge and most recently at Castletown Geoghegan this son of Beat All duelled with You Say What initially and in the end Tiger Sam before running out a good winner. This might well have been a good race as Noel Meades runner Tiger Sam had Nina Carberry in the saddle and they don’t normally turn up in this part of the world just for the sunshine. Bowe , based in Kiltealy , Co Wexford has started his season brightly and he recorded a nice double here when taking the very next race the 5 year old geldings maiden with Black Jack Rover and Barry O’Neill. mare Rainbow Sally take the Mares Winners Of One as the Taghmon, Co Wexford man was in Czechoslovakia for the world renowned Pardubice Steeplechase. This 4 runner race saw Ciaran Murphy’s Scarlet Feather try to lead all the way, but her effort petered out as Gary Murphy got a great run out of O’Keeffes mare to come through and win by a couple of lengths. 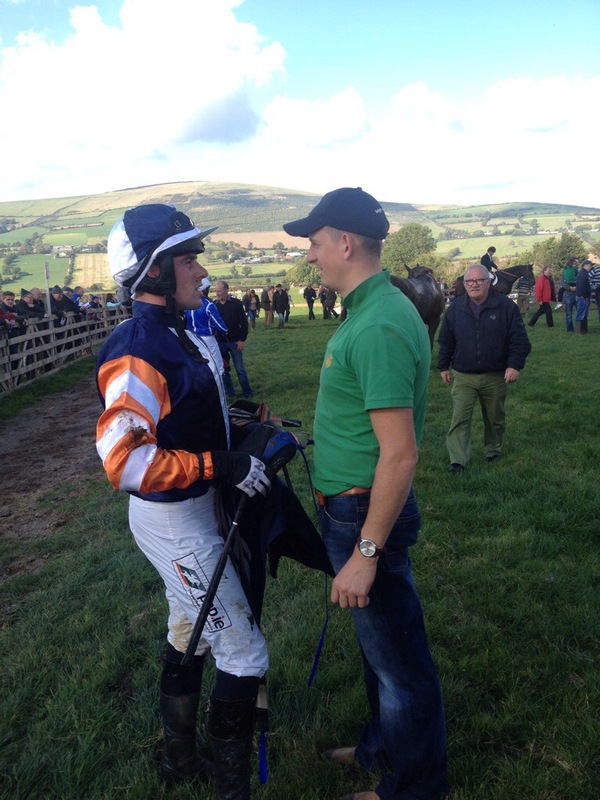 The Mares maiden saw another field of 7 runners face the starter with Kilsheelin , Co Tipperary based Eric Larkin saddling his first point to point winner in close on 14 years. With his last winner on the race track being 10 years ago he might be tempted to renew his licence following the win of Teaspoon under Harley Dunne. The 6 year old Tel Quel mare was last with under a circuit to run as Kates Cross and Dulcemara set the pace. But the whole complexion of the race changed three out as West Legend took much closer order. But none of them could cope with Dunne and Teaspoon as they ran out 8 length winners. John Walsh from nearby Ballyday, Co Wexford went into the final race on the card double handed with Lule Kyle and Street King ridden by his sons Aaron and Barry. He didn’t quite have the first two home but his son Aaron gave the 6 year old Hellissio gelding Lule Kyle a great ride to lead most near all the way and win by 15 lengths. Walsh , who has 7 horses in training took charge of this Noel Dempsey owned horse at the end of last season and built on the promise to win here. With the sun shining brightly for the whole afternoon this part of the world was like having a little piece of paradise on your doorstep, its a shame more people didn’t experience it! The Hollinwell and Klassy give racing at Tinahely and Lougrea a touch of Class. The Counties Galway and Wicklow hold court this Point to Point weekend in Ireland with the Shillelaghs at Tinahely and the Galway Blazers at Loughrea. The Open Lightweights take centre stage at both venues with 10 entries at Tinahely and 15 possibles at Loughrea. The entries all round at Tinahely are a little on the light side with only six races to be decided. That said the Open has attracted the star of 2013/14 in the Open sector with Eugene O’Sullivan’s The Hollinwell a possible runner giving racing a touch of class. O’Sullivan most likely has the horse well forward to race at this early stage of the season with the 11 year old Classic Cliche gelding having run last at Kinsale on June 1st. O’Sullivan shared the rides and the winners last season on the horse between his daughter Maxine and son Eoin. With Maxine setting out to defend her well earned Lady Riders title and Eoin probably hopeful of a tilt at this years Novice Riders accolade it will be interesting to see which one of these get the leg up on The Hollinwell. If he is saddled he looks a shoo in, but local Co Wexford trainer John Brennan might fancy a tilt at him with his wife Marie’s , Need To Know. This 6 Year old Definite Article gelding looked promising last year and has run well on the track in some Hunter Chases. If there is a chink in O’Sullivans horse this runner could take advantage and I’d reckon Brennan will stay close to home for the first run of the season rather than travel to the Galway Blazers meeting. Co Waterford based Vincent Halley might just split his entries here , Charlie Swift and Valentino’s Choice and take one to Galway, but thats just a guess. The 7 year old Beneficial horse , Valentino’s Choice seems to be the stronger one but it would be a surprise if he can beat either of the top two at Tinahely. Sam Curlings Klassy is the attraction at Loughrea in the Open Lightweight restricted to Lady Riders. The 12 year old Kahyasi gelding really needs to have the ground on the quick side and he rattled off a hat trick over 3 weekends in a row last summer finishing in Kinsale. Rachael Blackmore has developed a good partnership with him and are likely to win even more this season. The Last Derby has an entry here for David Christie and while his early season form tapered off last season a little he was still capable of winning, so don’t dismiss him lightly. The O’Connor men ( Derek and Paurick) will be trying hard to have a local winner here with Dancing Dik , but his form just wouldnt match up to the other pair. With a Winners Race at both venues, in addition to races for 4 year olds , 5 and 6 year old geldings and 5 year old mares some of these wont take much winning in my view as I scan the entries. But thats the game we are involved in, you pay your money and take your chances! Nevskij might just strip fitter on the opening day of the Point to Point season. So its just about here, the 2014/15 Point to Point season gets underway in Ireland with the Westmeath Foxhounds having the honour of staging the first meeting of the new season. This hadn’t always been the intention, but the Limericks and Mid Antrims all fell foul of the dry summer. So its the track at Castletown – Geoghegan that benefits with the recent rainfall no doubt helping to ease the going for man and beast. Chances are that we will see nearly all of the 2013/14 champions in action with hopes that Jamie Codd, Derek O’Connor, Maxine O’Sullivan, Rob James and even Robert Tyner in action at this early stage. With an entry of 97 horses the chances of a divide will be unlikely as the declaration level for the 5 and 6 year old geldings maiden having to be very strong to create a division. The opening 4 year old maiden has 21 entries , but it will be interesting to see just how many are given the green light to run. 16 horses are given an entry in the Open Lightweight with Eugene O’Sullivan’s, Galloping Gander, Paul O’Flynn’s, Nevskij and Denis Cullen’s , Sebadee all looking like holding strong chances if they are saddled. O’Flynns ,Nevskij has a piece of recent track form to his name and possibly will strip fitter than one or two more. The Novice riders have their day in the concluding older horses maiden while the Winners of Two might throw up a likely sort. But hey, its good to be back, see you during the season!